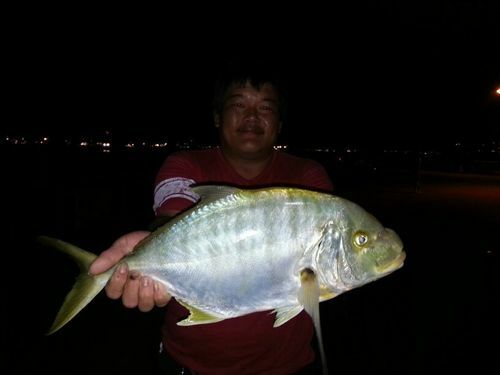 Ah An caught this 2.5kg golden travelly on a saturday afternoon. Finish of last night fishing at around 11.30pm to get some sleep. Wakeup around 7am and finish off washup, eat breakfast and go toilet before I rush down to the jetty to catch the last two hours of incoming high tide. So rush until I forgot to take my handphone along. Reach jetty setup two sets of tackles. Casted out both with bottom feeder n only one cable car rig on one of the rod on the left . But one angler come n place a rod with cable car rig n float just beside my rod on the left. The leader was so long….To avoid entangle..I shifted the cable car rig to the rod on the right. Moment later I saw my right rod tip rattle…the line gone loose…I strike and the fish jump up on the water surface…Ya…Wolf herring….I slowly wind in the line…then use my rod to lift it up…1.4kg…nice big wolf herring.